How do you wrap your head around such a huge place with 10,000 years of human history? Get a deep dive into Alaska culture and history at one of these Anchorage attractions. The Anchorage Museum is a world-class facility with a fascinating depiction of Alaska&apos;s history and art of the far north. Open year-round, the Museum also features permanent and traveling exhibits, special programs and many annual events. 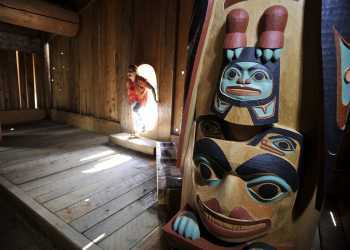 Learn of Alaska’s diverse Native cultures at the Alaska Native Heritage Center. Spread across 26 acres, the Center includes six traditional village settings surrounding a two-acre lake. Within the Welcome House, Alaska elders and youth celebrate their traditions together while the beats of their drums move gathering crowds. A survivor of Alaska’s pioneer era, the Oscar Anderson House in Elderberry Park, was built in 1915 by a Swedish immigrant. Listed on the National Register of Historic Places, many of the original artifacts belonging to the family remain in the home to this day. More than 600 take-offs and landings occur on a peak day at the world’s busiest float plane base, Lake Hood. Nearby, the Alaska Aviation Museum displays vintage aircraft and tells the story of Alaska’s unique aviation history. Those interested in Alaska’s early indigenous life should also visit the Alaska Heritage Museum at Wells Fargo, which holds one of the largest collections of Alaska artifacts, and Eklutna Historical Park, a cemetery with colorful spirit houses and the Saint Nicholas Russian Orthodox Church – the oldest standing building in the greater Anchorage area. With Joint Base Elmendorf Richardson just north of downtown, Anchorage is home to a strong military community. The link between the city and its service members is evident at the Alaska Veterans Museum. Located in Fourth Avenue Market Place, it tells the stories of individual military service members through memorabilia, photos, posters and more. A few blocks away, the Alaska State Trooper Museum tells the story of the officers who brought law and order to the Last Frontier.